To help solve this problem before it happens again, communities and city air quality districts are looking at IoT solutions. The implementation of financially feasible and mobile air-monitoring equipment can provide vital data about local air pollution to help families and emergency responders navigate wildfire evacuations safely. IoT solutions are coming to market that automatically gather real-time air quality data by neighborhood and push it to the cloud, where monitoring systems can break down the data and deliver easy-to-understand analytics. Armed with precision air quality data, city managers can create not only safe evacuation plans during wildfires, but manage day-to-day issues, with effective traffic planning and commercial and residential zoning. And urban dwellers can use the data to decide whether to do that morning jog, take the metro or bike to work or simply stay inside, if air quality levels are in the danger zone. More scientists are attributing climate change as one of multiple factors driving an increase in natural disasters. This is especially the case for wildfires, which are heavily influenced by human land-use and management practices in addition to the weather. The higher number of fires creates a negative climate feedback loop, stemming from an increasing concentration of carbon dioxide emitted into the atmosphere from the fires. Even though government pollution monitors often provide highly accurate data, they aren’t widespread because of the $200,000 to $250,000 per monitor cost and stationary requirement. That’s why the most recent Northern California wildfires indicated the immediate need for cost-effective pollution sensors and smoke-monitoring satellites that provide real-time data, and can travel long distances. 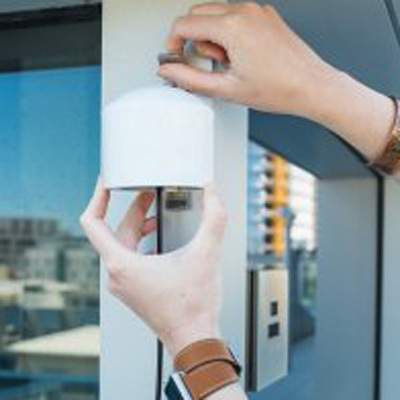 One of the up-and-coming companies using IoT to monitor air quality is Aclima, based in San Francisco. Founded in 2007, Aclima’s mission is to “deploy sensor networks that extend the senses and bridge the gap between ourselves and the natural world” to address the co-existing needs of environmental and public health. Aclima currently partners with Google to deploy Google Street view cars from a garage at the Embarcadero pier in San Francisco. The cars have roof inlets that take in fine particles and other types of pollutants from the environment. The cars’ equipment contains low-cost sensors and lab-grade measuring capabilities. During the recent Northern California wildfires, Aclima used its portable monitors to measure air quality in various cities, as wildfires deviate from the usual pattern and can send plumes of smoke across cities hundreds of miles away. The mobile Aclima monitors discovered that air quality in the hills of the East Bay was much worse than in the flatlands, further proving the need for mobile IoT systems vs. stationary air monitoring systems. Another competitor using smart technology to measure air quality is PurpleAir. Its sensors, designed for air quality professionals, city governments and home installation, cost less than $300. PurpleAir sensors use a fan to draw air past a laser, causing reflections from any particles in the air. These reflections are used to count particles in six sizes between 0.3μm and 10μm diameter. In compliance with the Clean Air Act, the EPA has released public information about six types of air pollutants, also known as criteria pollutants, that pose public health and environmental health concerns. According to the South Coast Air Quality Management District in California’s Orange County, PurpleAir’s PA-II sensor had the most accurate results for air quality tests, which were also conducted by the EPA using its more expensive government sensors. With this information in mind, transportable and less expensive IoT sensors can keep up—and often outcompete—with government air quality sensors and save lives in the midst of wildfires and other natural disasters. While gathering air quality data is the first step in fighting air pollution, another critical piece is analyzing the automated measurements. Sameer Sharma, general manager of new market development for IoT Solutions at Intel, reports that Intel has worked with Bosch on its Air Quality Micro Climate Monitoring System (MCMS), which is an end-to-end solution that collects air quality information across large areas. See the mobile air mapping results, pollution maps and other data collected from the Aclima sensors on a recent project in California on the EDF website. Learn more about PurpleAir sensors. View the real-time air quality map using data from PurpleAir sensors.